Concurrency means performing two or more operations at a time. When we perform multiple operations at a time we may utilize CPU to its full capacity and that’s why concurrency is powerful technique to make better performing software. Multithreading is form of concurrency which uses multiple threads to execute multiple operations at a time. Multithreading is traditional techniques to achieve concurrency but in modern programming we have parallel processing and asynchronous programming to achieve concurrency which is better than using a thread. Parallel processing idea comes from multithreading where multiple threads can run on multiple cores of CPU. Nowadays processors are powerful and have multiple cores to perform multiple operations simultaneously and no time slicing are required since all executes on different cores. Asynchronous Programming is an another form of concurrency which avoids to create unnecessary threads to achieve concurrency. Asynchronous programming uses callbacks or futures (promise) to achieve concurrency. An asynchronous method is considered that it will be completed in future. Above we put a sleep of 4 seconds in main thread, we can see line “Read End” after line “Main Sleep” because when main is in sleep awaited operation is completed and control goes back to finish "ReadAsync" method, once it is completed it comes back to main thread and completes it. Async: async & await keywords are introduced in C# which enables asynchronous programming, any method we want to call asynchronously should be marked as async, an asynchronous method returns Task, Task<Result> or can be called a promise. A promise is something a method is expected to return on completion (in future). 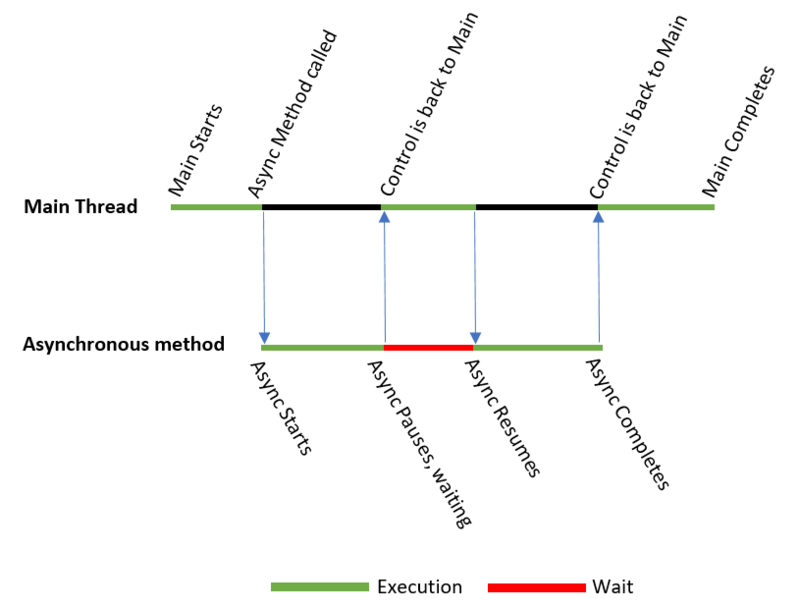 Await: await keyword defines a wait for a task, until a task is completed await doesn’t let next statement to execute, it pauses the execution of async method, if result of awaited task is already produced then it executes the next statement else control goes back to caller and starts execution there. As soon awaited task is completed the control again comes back to the asynchronous method to complete the pending. An asynchronous method should have at least one await inside else asynchronous method and synchronous method doesn’t make any difference hence asynchronous method is executed as synchronous. Since it does not create any new thread to execute a asynchronous method it performs better than conventional multithreading techniques. For parallel processing multithreading is better option but both multithreading and asynchronous programming are different techniques but servers similar aspirations.